Are you paying a charge to the airlines for checked bags? If yes, then today this guide will save your some penny for sure. If you are frequent traveler then paying a charge every time to the airlines is not fair. But what if you don’t have to pay a single penny while checking airlines? You will need best under seat luggage that can easily fit under the seat of the airplanes. Before, we move ahead and check the list. Let me share with you three-four considering factors those you have to consider while buying best under the seat carry on luggage. Wheels: There is full confusion between two-wheeled or one wheeled carry-on luggage among the travelers. When you are going for long run traveling you will need a two-wheeled and easy to carry handle containing under seat luggage bag which will take off the load from your shoulders and won’t strain your hands. 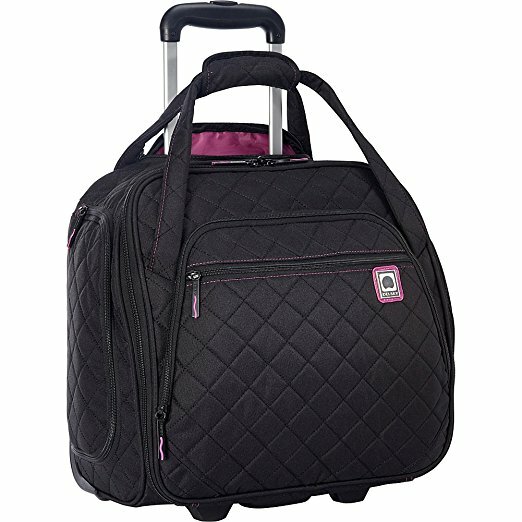 But, When you are going for one or two days trip then one wheeled travel bag could be the best option. Soft-sided bags have lightweight and easy to fit under the seat of the airplane, but it provides the less protection to your valuable items. While hard-sided bags have a heavy weight and don’t fit under the seat of the airplane because the materials used. It also heavy and would not be the best choice for under seat luggage bags. But when we look at the protection of the stored items inside the bag then hard-sided bags would be the best option. It’s not necessary to check that you have to take into the consideration because not every bags offer waterproof feature and If we look at the price then waterproof feature luggage bags have high price than the normal ones. If you have a requirement for it and you are traveling very often in the monsoon season, you should check this feature. High performance and great positive reviews, Lucas wheeled under the seat cabin bag provide durability and comfortability during traveling journey. The main storage compartment includes zippered, along with pull-down access for easy visibility of your items. It’s simple, durable and affordable in price that is accepted by most of the airlines. When we were looking for customer reviews, we found the best performance and positive feedback. Whether you are a journalist, frequent travelers, and weekend travelers this luggage bag would be the great option. If you look at the design, you will find excellent construction for handles, wheels and internal frames that will provide you great durability. It’s available in three different colors red, blue and black. This bag is ideal for storing and quick changes of clothes, mobile phones or tablets, and comfy slippers. Samsonite is a very popular brand in luggage bag industry which never disappoint his customers. 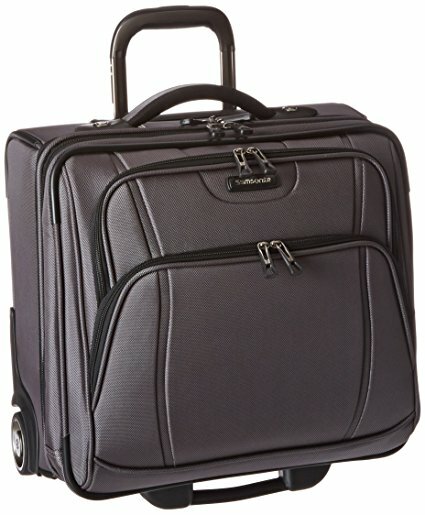 If you are a regular traveler who travels for short trips of three-four days via plane, then you must check Samsonite wheeled under seater large bag once. When we look at the storage area, It offers a large main compartment to store dry clothes and large sized items, and plastic zippered compartments help you to store mobile phones, tablets and important documents. 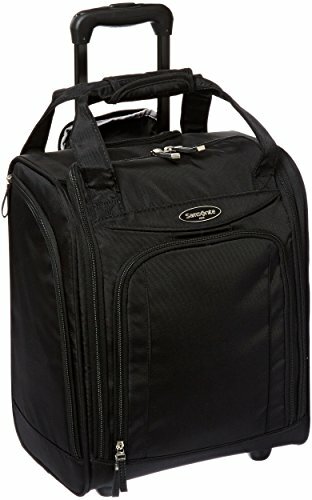 So if you are looking for an under seat rolling carry on luggage bag that comes with the classical and impressive design, then you must check this bag once. 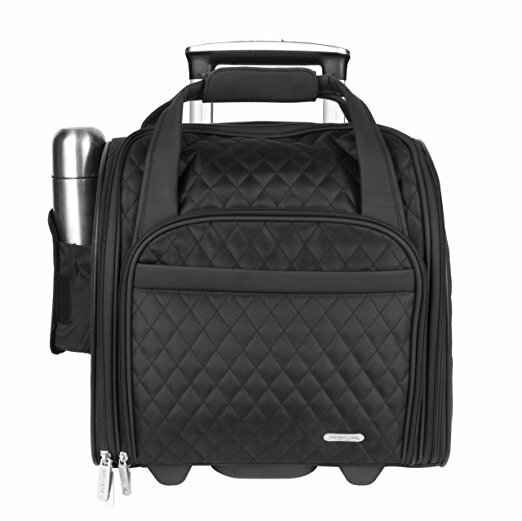 It comes with two wheels and a retractable handle to carry the under seat luggage bag. It’s constructed with high-quality materials like 100% polyester and nylon lining with keep in mind thelightweightt nature, and interior frames finishing is superbly designed. If you are looking for high quality and extraordinary under seat luggage bag, then Briggs & Riley Baseline luggage rolling cabin bag would be the best option to go with. It comes with three different compartments, in which you can store clothes, important documents, and other personal items. There is separate compartment to put iPad or tablet that don’t mix up with other stored items. The large u-shaped opening on the front side gives you the facility to store extra items like power bank, chargers, pen cd/DVD, pen drives, etc. While side zipper helps you to store keys, necessary documents like passport, the visa that requires at security checkpoints. The heavy-duty ballistic nylon outer fabric construction resists wear, moisture, dirt, and abrasion. While comfortable webbing handles, help you to carry bag easily. As I told you earlier, Samsonite is very popular in the luggage bag market because of its great products. 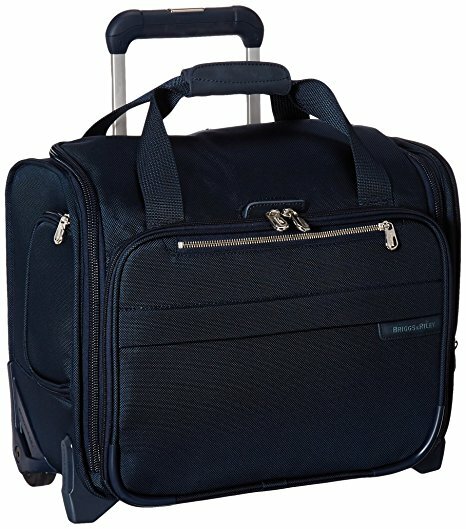 One of the top product is Samsonite DK3 under sweater bag. The difference between Samsonite wheeled underseater bag, and Samsonite DK3 understeater bag is a Dk3 model is made with 85% polyester and 15% nylon materials with fabric lining while another one is made with 100% polyester and nylon lining. It’s specially designed for who are looking for padded laptop compartment to hold 15.6-inch laptop. It’s designed so well that it can fit under the seat of airline and easy to take off during the route. It comes with multiple stash pockets to store small sized items like personal items, pens, books, power banks, and chargers. 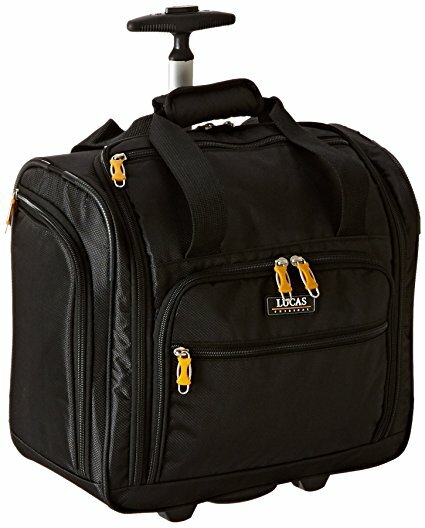 The smooth rolling two wheels and push button locking handle makes the bag top product on the Amazon. 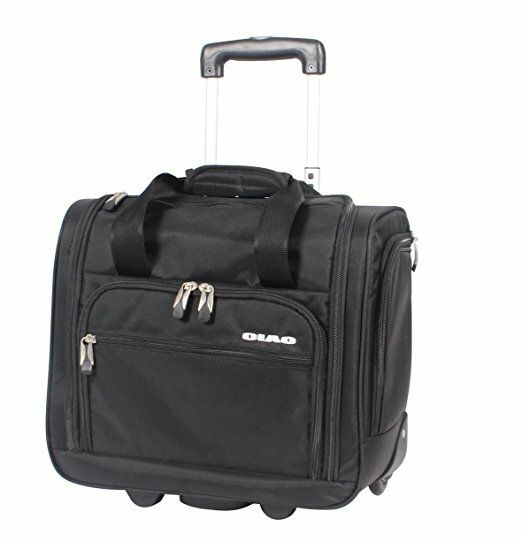 If you are on the tight budget along with best features then ciao carry on luggage could be the best option for you. This bag is the great choice for individuals who are looking for lightweight and well-constructed bags. It’s made of 100% ballistic nylon material which is high-grade material than the polyester fabric material used in other-other bags. Whenever you want to go on short trips, instant business trips or family weekends then ciao carry on rolling luggage is the best. The ergonomic handles with easy, comfortable grip won’t strain your hands during traveling. The interior organized pockets allow you to store small items like pen, papers and important documents. Do you want to purchase stylish under seat luggage bag for your next flight? …then Delsey under seat rolling carry-on luggage would be a great choice. It’s easily stored under the airline seats and easy to take off during the route.Plus easy to fits on overhead compartments of the flight. The front pocket organizer helps you to store electronics items, personal documents which are easily used during your flight. It’s available in three different colors black, navy and teal while roomy main compartment holds an extra pair of shoes and clothes. The construction of this bag is done using 1800 denier polyester material which is soft. It looks more stylish because of its interior lining design with different colors. There are plenty of interior pockets that allow you to store small items including toiletries. Travelon is one of the brands in the luggage industry; they are producing a large amount of high quality under seat rolling carry-on luggage bags. It’s impressive design on the outer and in the interior part make it best rolling carry-on garment bag that fits under the seat of the airlines. When you look at the internal part, It includes the main compartment along with zipper pockets to store small items like personal documents, files, etc. The front side zipper pocket helps you frequently store accessible items including power bank, charger, earphones, etc. One of the great feature we liked it’s made from microfiber materials which reduce the weight and looks classy design. The side zipper pocket is specially designed to store a water bottle. Before buying any luggage listed above, do consider your requirements first then decide which is best for you. If you are on a limited budget, then Samsonite DK3 underseater bag would be great for you otherwise Lucas wheeled under the seat cabin bag is best choice to go with. We hope you liked our article if so, don’t forget to share on social media and with your friends who are looking for the under seat luggage bag for his/her next trip.